Time Peace is the ultimate watch company of the present. When we last spoke with them, they were entering an exciting growth phase as they traveled around the country spreading their message of peace and living in the moment. Having built a global movement around their brand’s core philosophy, Time Peace is now getting back in touch with their roots in their hometown of Miami. For those of you new to the ‘Live in the Now’ movement, Time Peace founder Ian Koslow began the company with the idea that every watch was telling the wrong time. He wanted to create a ‘timepeace’ that would remind people to live in the present, while only displaying the conventional clock time when absolutely needed. Simply double tap the face of your Time Peace and LED lights illuminate around the circumference to display the time — the blinking light represents the hour and the solid lights represent the minutes. We received one of their new Light Warrior’s in the mail, and so far it’s been turning heads everywhere we go. Without fail, everyone who sees the watch wants to know what it is and where they can get one. What appeals most to people is the ideas which the watch embodies: time is an illusion, perception creates reality, everything is interconnected and the universe is in alignment. The Conscious Connection team caught up with Ian to discuss the Time Peace philosophy and learn about how you can turn your passions into a real business that has a positive impact. Conscious Connection: It’s great to be back with you Ian. So what’s going on new at Time Peace and what’s in store for the future? Ian Koslow: We’ve based ourselves back in Miami for now and we’ve created the best peace we’ve ever made, so we’re really excited. We’re not thinking too much about the future; we’re just really focused on what’s going on now and trying to grow the brand and spread awareness with our new peaces. Conscious Connection: Makes sense for a company based on helping people live in the now. Tell me about the inspiration behind your new line of Lightwarriors? Ian Koslow: The original idea behind Time-Peace was that all of our watches wouldn’t tell you the clock time until you needed it –the Lightwarrior expresses the tp philosophy better than any peace we’ve made in that it doesn’t show you the clock time until you tell it to light up. We took everything about the last version of the Lightwarrior and basically made it better – we wanted to make the watch vegan and mermaid friendly (rubber band and waterproof) because TP should be for everyone. Conscious Connection: Why is the peace sign upside down in your design? Ian Koslow: We see it as right side up.. Bedeekin (our ethergenic/miacrocosmological consultant) told us that by flipping it we would be displaying the tree of life. 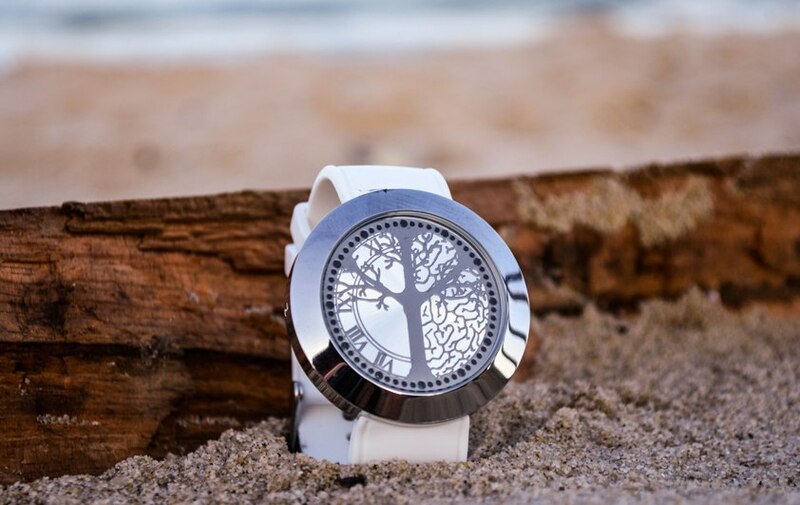 To us the tree of life represents the interconnectedness of all life in the universe, a true symbol for peace. By pure TP synchronicity, we were recently reached out to by Tim Holtom, the nephew of Gerald Holtom – designer of the original international peace sign. Tim told us that his uncle actually intended for the peace sign to be right side up, but it was printed before he could make the change. He told us that Gerald would have been really excited and loved what we are doing.. Pretty cool! Conscious Connection: Any advice for other social entrepreneurs looking to start a “movement”, build a brand and be a beneficial presence on the planet? Ian Koslow: Find something you’re passionate about – keep dreaming, don’t put limits on what is possible – put as much energy into your idea as you possibly can – believe in yourself – help others whenever possible – smile – never give up – have faith in the universe – be yourself – and save the world!